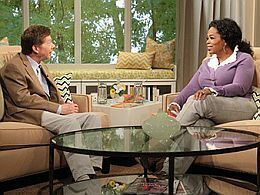 Below is a summary form Oprah’s Life Class where Oprah and Eckhart Tolle discuss “The False Power Of The Ego”. Are you, like most people, identified with your external appearance? In the U.S. one can even say that the culture is “label obsessed”. People think that the label of their clothes, bags shoes, gadgets etc. represents their value, and often spend more money on designer items than they can really afford. They let the Ego take over their lives. The Ego is our self-image of who we think that we are, and not our true self. If you recognize yourself to be identified with designer items and want to move beyond the Ego, the first step is to be aware of the Ego (that you are addicted to designer things). As you start recognizing the Ego in your life, your awareness diminishes the Ego. Next step is to decide if you want to let it go. If you are not ready to let go of the Ego, the Ego pattern will create suffering at some point for you. For example, you might get into heavy debt because you can’t stop spending on designer items. Many people can’t go beyond the Ego, until they can’t stand it now more and just want to end the suffering. The lesson may have to come in many forms for you until you can see that you are not the Ego. The answer is not to wait; it’s to wake up now. If you were totally identified with the Ego, you wouldn’t even recognize the Ego, so you have already begun your awakening. If you want your “true self” to run your life and not your Ego, you need to look deeper within and discover that there is a more real place within you from which you can derive your sense of self or sense of identity. For example: Ask yourself where your thoughts are coming from. Also, as you are observing something, recognize that there is a consciousness that is doing the observing…. If you feel bad when something good happens to another person, it is the Ego at work. This unpleasant feeling is letting you know that the Ego has taken over your thinking and feeling. The Ego recognizes this event – when somebody else has received something good – as if something has been taken away from you, but this is a complete illusion. To be able to move beyond the Ego it’s important that you become still so that you can recognize the Ego. Then, for every time you recognize the Ego, it diminishes. VIDEO: What Oprah knows for sure about the Ego. Do You Care About Other People’s Opinions? When other peoples voices (their opinions of you and what’s best for you), are very “loud” in your head, your Ego has taken over and your “inner knowing” is blocked. You make other people’s thoughts about you, become your own thoughts about yourself and get trapped in that merry-go-round of conceptual thinking about who you are. This blocks the access to the deeper level of knowing. To reconnect with your inner knowing / your true self, you have to learn to become still so that your attention drops out of thinking into a state of presence and awareness. You will never be able to connect with your “inner knowing” if you allow everyone else’s voice matter more to you than your own, because the voices of the world will drown out your “inner knowing”. If you keep asking people: “What do you think?”, it means that you are not connected to your “inner knowing”. In order to connect with your own “inner knowing” you need to go to that inner space where stillness is. You can find that space within yourself even though you are surrounded by “noise”. It comes from the willingness to still yourself. As you find your inner space, you will start recognizing the Ego (the voices in your head) and realize that this is not your inner knowing / your true self. Eckhart Tolle explains how to find that inner space in his book “Stillness Speaks”. People are just giving their observation; their point of view; and you are giving it meaning. You get to choose what that meaning is. It is quite common for parents to incorporate their children into their own Ego. If your child becomes a part of your own Ego, your expectations of your child will eventually depend upon the child’s behavior and “force” the child to behave in ways that he/she otherwise would not behave. Even if you don’t “force” the child into doing what you wish, the child can feel/sense the power behind that expectation. Your expectations create a “straight jacket” for the child, and you are feeding your child’s Ego in the process. The child understands that he/she gets most of your attention when he/she is doing well and less attention when he/she is failing. Why does this affect the child? For example, it is quite common that parents in China, Japan and South Korea have great expectations for their children. Studies show that children in South Korea are deeply unhappy. In fact 40 people commit suicide every day in South Korea because they are not in touch with who they are and try to live up to their parent’s or society’s expectations. If you continually praise your children for what they are doing, then they become attached to the doing, which won’t allow them to see who they truly are. Should You Fight or Love the Ego? Should you fight the Ego? Don’t make your Ego into some kind of enemy that you fight against, because then you create more problems in your life. You can’t fight the Ego, you only need to recognize the Ego, because it means that awareness is coming in and then Ego automatically diminishes. Should you love the Ego? The Ego is not an entity – it’s a misperception of who you are, and you can’t really love a misperception of who you are, but you can love the totality of your life experience and that includes the Ego. Recognize the ego in the present moment and when your awareness comes in the Ego diminishes. So let’s say that the present moment “is making you” irritated, angry, upset, sad etc. Remind yourself that it’s not the situation that is causing this feeling, it is what your mind (the Ego) is telling about the situation. Recognize the ego in the present moment when an unpleasant situation arises, and stay present. Don’t react by following your impulses, which is exactly what your Ego wants you to do, because Ego loves drama. When you recognize the Ego, its false power and influence diminishes.